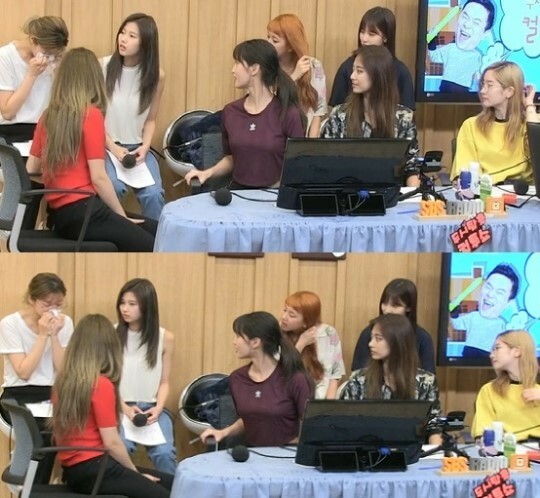 On July 12, TWICE appeared as guests on 'Cultwo Show', where they got honest about their comeback with "Dance The Night Away". During the radio show, special DJ Jang Do Yeon asked, "Do you guys check your chart rankings?" The members answered, "Of course. We stream our song a lot, plus we check the chart rankings every hour. If you look at the members' phones, they're all streaming the song with the sound off (Laughter)." On this day, Jungyeon was also spotted shedding tears due to the fact that her family's pet dog is currently very ill. She excused herself to gather her bearings midway through the show, then returned to wrap up brightly with the rest of her members. We hope Jungyeon's dog gets better soon!